When tech companies like Google came to the Pittsburgh neighborhood of East Liberty, Penn Plaza apartments — a complex that used to provide affordable housing — was torn down to make room for a Whole Foods and high-rises. And Amazon is threatening to cause similar damage with the possible arrival of its second headquarters, or HQ2, in Pittsburgh. Amazon is expected to announce later this year which of twenty cities it is considering as finalists to house its HQ2. Regardless of the company’s decision, Pittsburgh’s best course of action is to develop preventative policies. If Amazon comes to Pittsburgh, the City and its residents must respond with an affirmed commitment to protecting the communities that would be impacted most by the consequences. Seattle, the site of Amazon’s “HQ1,” is an omen of what is to come if the e-commerce giant settles down in an unprepared Pittsburgh. As Amazon has grown and expanded in Seattle, the cost of living has soared. Rent has increased by almost $1,000 since 2011 from an average of $1,200 to $2,150. Like much of the West Coast, the median home price is out of reach for most homebuyers — to afford a mortgage in Seattle, one needs to make almost $100,000, while in Pittsburgh a salary of $35,000 will suffice. As a result, the company has received significant pushback from Seattle residents, many of whom blame Amazon for hikes in real estate costs and traffic gridlock. The most recent spurt of anger came after Amazon threatened to stop construction in the city following a proposed tax on large employers to help the homeless. Analysts expect a similarly devastating rise in Pittsburgh. According to PublicSource, rent prices are falling by roughly 1 percent per year, but the arrival of Amazon would cause rents to spike by 2 percent. And real estate companies are already speculating — the New York-based Swift Creek SFR Lemieux, LLC purchased 18 homes in Hazelwood earlier this year, all adjacent to a proposed Amazon HQ2 site in the neighborhood. And Pittsburgh’s past relationships with tech giants have largely failed local communities as well. Uber’s autonomous vehicle program is based in Pittsburgh, and the company promised to hire people from the neighborhood that hosts its self-driving car testing site, Hazelwood. “We are committed to our community and will continue to work with local schools, community engagement groups, and non-profit organizations to make a positive impact in the Steel City,” an Uber spokesperson said in an email. But Uber didn’t deliver on its promise. Tim Smith, a community leader and pastor in Hazelwood, told The New York Times that he even provided the company with a list of prospective job candidates. Smith said not one of his proposed candidates received a job. With the addition of Amazon, Pittsburgh could experience growth. In addition to the jump in tax revenue the region would experience, the presence of Amazon’s HQ2 in the City could directly create 50,000 jobs, according to estimates from Good Jobs First, a national policy resource center, and the Institute for Local Self-Reliance. And while some of these jobs would go to transplants to the City, anywhere from 15 percent to 20 percent of the jobs would go directly to Pittsburgh residents. In addition, it could indirectly create another 50,000 jobs due to increased need for services. With the arrival of transplants, more people would shop for groceries, eat at restaurants and purchase items for home improvement, creating the need for more workers here. Not only that, but the City could also experience a boost in the public transit sector. Recently, Amazon dedicated $1.5 million to increasing bus service in King County, Washington. And back in 2012, Amazon invested more than $5 million into the development of Seattle’s streetcars. Since Pittsburgh is trying to expand its bus infrastructure with a Bus Rapid Transit (BRT) system connecting downtown Pittsburgh and several other communities, it could benefit from similar investments. The only way Pittsburgh can hope to counteract these negative impacts while still benefiting from the positives is through strong policy proposals. This primarily means commitment to building affordable housing — ideally with direct contributions from Amazon. In every city the company visited, company representatives asked city officials what they would do to support affordable housing projects and public transportation infrastructure. And while Pittsburgh promises Amazon appears willing to listen to proposals to mitigate the negative impacts it could have on a region, a recent UPMC incident demonstrates that just listening isn’t sufficient to cause any meaningful change. The UPMC expansion project in Uptown was met with pushback from community activists who wanted the health giant to commit to a community benefits plan. Instead, City Councilor Daniel Lavelle — whose wife sits on the board of UPMC Mercy — brokered a deal directly with UPMC. The resulting plan did not address many community demands, like improved access for communities in Uptown and better wages for employees. This shows that it isn’t enough for companies to promise to effect change in a community. Pittsburgh already has some of the most affordable housing in the country. While Amazon would spike these housing prices, the city is well-poised to enact countermeasures that will keep prices low. It can start with a moratorium on tearing down affordable housing complexes, and providing incentives to build more of these complexes. 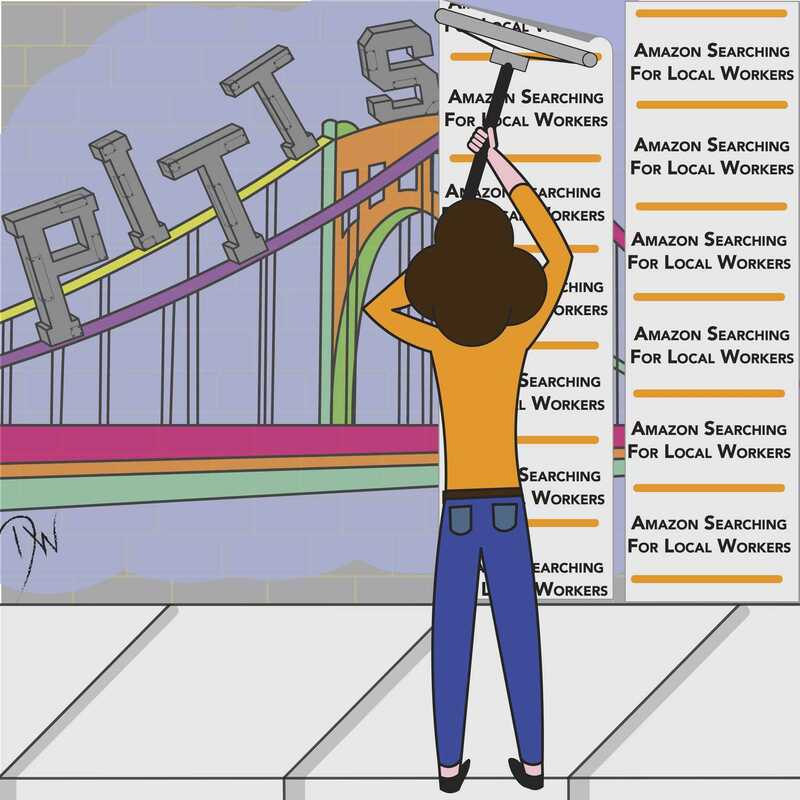 If Amazon decides on Pittsburgh as the location for its HQ2, its arrival has the potential to be both an economic boom and a catalyst for the displacement of low-income communities. If the Steel City is the final location, then the City and its residents need to do everything in their power to ensure they capitalize on the former and prevent the latter.